Protect Your Friends and Loved Ones : The Harmonic Shield Gift Pack ! As health professionals near the end of long careers, our time to work with individual patients is winding down. But our calling and interest for healing continues ! 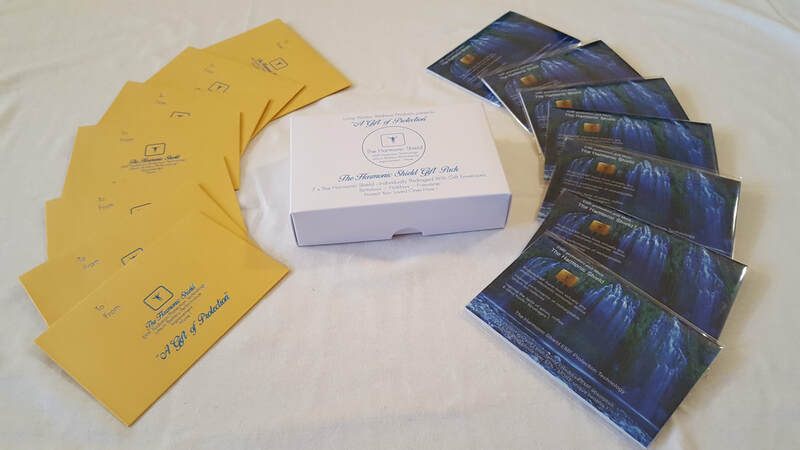 We want to let you know that we've just brought out a Gift Pack version of The Harmonic Shield - each pack contains seven of our Harmonic Shield 1 Pack, with lovely gold gifts envelopes. They’re gifts as thoughtful and caring as any you’ll find this year – a gift of protection ! We’ve also found one more way to support our work : you can help our Living Waters Wellness initiative just by shopping on Amazon.com. We now have links to Amazon at the bottom of all our Living Waters Wellness pages. When you click through to Amazon, a small part of every purchase you make will benefit Living Waters Wellness. Please remember us when you do your Amazon holiday shopping this year – and any time you shop there ! To help our Living Waters Wellness initiative, please click the links below ….. and shop for things you want and need !